Marcell Dareus (born March 13, 1990), is an American football nose tackle for the Buffalo Bills of the National Football League (NFL). He was drafted by the Bills third overall in the 2011 NFL Draft. He played college football at Alabama, playing defensive end in the Crimson Tide's 3-4 defense. He was named Defensive MVP of the 2010 BCS National Championship Game. 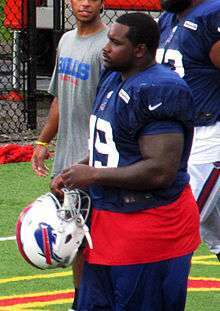 Dareus attended Huffman High School in Birmingham, Alabama, where he played football, basketball, and competed in track & field as a shot putter. In football, he was an ASWA All-State honorable mention at defensive lineman. He totaled 117 tackles and 20 sacks as a senior, and also returned a fumble for a touchdown. He was teammates with Andre Smith. Dareus was listed on the Atlanta Journal-Constitution's Super Southern 100, as well as the Mobile Press-Register Elite 18. Considered a four-star recruit by Scout.com, Dareus was listed as the No. 5 defensive tackle in the nation in 2008. He chose Alabama over offers from Auburn, Tennessee, North Carolina, among others. In his true freshman season at Alabama, Dareus played in eight games, making his debut in the Crimson Tide's season opener against Clemson. He registered four tackles while recording three quarterback hurries. Dareus saw playing time at nose tackle in third-down-and-long situations, replacing the pure run-stuffing Terrence Cody. As a sophomore, Dareus was a big contributor all season at defensive end for Alabama. He played in 14 games and made four starts while serving as the Tide's top pass rusher and finishing seventh in the SEC in sacks. He totaled 33 total tackles, 9.0 tackles for loss (−49), seven quarterback hurries, an interception and two pass breakups. He finished eighth in the Southeastern Conference and ranked tied for 90th nationally with 6.5 sacks (−44) or .46 per game. For his performance, including a 28-yard interception return for a touchdown, Dareus was named defensive MVP of the 2010 BCS National Championship Game. In July 2010, Dareus was investigated by the University of Alabama in conjunction with the NCAA into whether Dareus paid his own expenses when attending a party in Miami, Florida hosted by a sports agent, and whether the circumstances constituted a NCAA violation. In early September, the NCAA suspended him for the first two games of the season in addition to requiring him to pay back the $1,787.17 received in impermissible benefits to the charity of his choice. After the university decided to not appeal the ruling, he made his 2010 debut against Duke in week three. For the season, he totaled 34 total tackles, 11.0 tackles for loss (−41), 4.5 quarterback sacks (−26), ten quarterback hurries and four pass breakups. In the week following the Capital One Bowl victory, Dareus declared his eligibility for the 2011 NFL Draft on January 7. At the time of the announcement, he was projected as a first round pick. Dareus was selected third overall by the Buffalo Bills in 2011. He was the highest selected defensive lineman in Crimson Tide history, and the highest selected Alabama defensive player since Cornelius Bennett in 1987. Dareus was selected with the 3rd overall pick in the 2011 NFL Draft by the Buffalo Bills on April 28, 2011. On April 29, the day after the first round, the Bills announced that Dareus would wear jersey number 99. On July 29, 2011, Dareus signed a 4-year deal with the Bills worth $20.4 million. Dareus started all sixteen games for the Bills, registering 5.5 sacks, the most for a Bills rookie since the now-retired Aaron Schobel, despite suffering injuries to his shoulder and hand during the season. In 2011 Dareus became a member of School of the Legends (SOTL), an official partner of the NFLPA. In 2012, Dareus was excused from the team after his younger brother was shot and killed. He was named to his first Pro Bowl in 2013 as an injury replacement for Justin Smith of the 49ers. On May 5, 2014, Dareus was arrested in Cleburne County, Alabama, on charges of possession of a controlled substance and possession of drug paraphernalia, but was released within an hour. On June 3, 2014, Dareus was arraigned in Hamburg, New York on charges over a car accident stemming from an alleged drag race with teammate, Jerry Hughes. On May 21, 2015, it was announced that Dareus would be suspended from the first game of the 2015 season, due to a violation of the league's substance abuse policy. On September 10, 2015, the Bills signed him to a new 6-year contract extension that could reach $95.1 million with incentives, the contract also included $60 million in guaranteed money. With this contract, Dareus has the most guaranteed money in the NFL for a non-QB. On August 16, 2016, it was reported that Dareus was facing a four-game suspension due to his second violation of the NFL’s substance-abuse policy. 1 2 3 University of Alabama Department of Intercollegiate Athletics. "2008–09 Cumulative Season Statistics: Overall Defensive Statistics". RollTide.com. Retrieved January 8, 2011. 1 2 3 University of Alabama Department of Intercollegiate Athletics. "2009–10 Cumulative Season Statistics: Overall Defensive Statistics". RollTide.com. Retrieved January 8, 2011. ↑ Whiteside, Kelly (January 8, 2010). "Alabama sidesteps Texas' charge to emerge with BCS title". USA Today. Retrieved January 8, 2011. 1 2 3 Goodbread, Chase (September 3, 2010). "Marcell Dareus suspended two games". The Tuscaloosa News. Retrieved January 8, 2011. ↑ Goodbread, Chase (September 6, 2010). "Dareus suspension won't be appealed". The Tuscaloosa News. Retrieved January 8, 2011. 1 2 University of Alabama Department of Intercollegiate Athletics. "2010–11 Cumulative Season Statistics: Overall Defensive Statistics". RollTide.com. Retrieved January 8, 2011. 1 2 Reynolds, Brian (January 7, 2011). "Ingram, Dareus, Jones going pro, Hightower returning". The Tuscaloosa News. Retrieved January 7, 2011. 1 2 Kausler, Jr., Don (January 7, 2011). "Tide's Marcell Dareus, Mark Ingram, Julio Jones announce they are going pro". The Birmingham News. Retrieved January 7, 2011. ↑ Goodbread, Chase (April 28, 2011). "Four UA players go in first round". The Tuscaloosa News. Retrieved April 29, 2011. ↑ Gaughan, Mark (July 29, 2011). "Bills' First-Rounder Dareus Gets $20.4 million Deal". The Buffalo News. Retrieved July 30, 2011. ↑ Anthony Stalter (2011-06-06). "Kevin Carter talks NFL lockout, Steve Spurrier and SchoolOfTheLegends.com". The Scores Report. ↑ "Marcell Dareus arrested in Alabama". ESPN. May 7, 2014. ↑ "Marcell Dareus charged with drag racing, sent home by Bills". USA Today. June 3, 2014. ↑ "Marcell Dareus suspended for first game of '15 season". Around the NFL. May 21, 2015. ↑ "Defensive tackle Marcell Dareus facing four-game NFL suspension". BN Blitz. 2016-08-16. Retrieved 2016-08-16. ↑ "Marcell Dareus Stats". ESPN. ESPN Internet Ventures. Retrieved 9 February 2016.